Better bet!This product has been added to your cart, bravo! In addition to its deeply pigmented color and high shine finish, this red polish has a formula made from 84% plant-derived raw materials, which is enriched with plant keratin and starflower oil. Amazing Grace? Absolutely! PURE color is a range of cleaner, greener, 10-free nail polishes. Make life (and your manicure) easier with our 2-in-1 Base & Top Coat. In order to go even further in our mission to be as eco-friendly as possible, we have chosen to use renewable plant-sourced natural ingredients (derived from raw materials such as potato, maize and cotton) in our PURE color polishes instead of petrochemical-derived nasties. This whole range is free from paraben, toluene, dibutyl phthalate, formaldehyde, xylene, styrene, camphor, resin of formaldehyde, benzophenone-1 and nanoparticles. Before you begin, remove any remnants of polish and wash and dry hands thoroughly. A clean surface is key to a long-lasting, smooth manicure! 1. First thing’s first: a layer of base coat for a long-wearing color and protected nails. 2. Apply a coat of Grace in three swipes: one down the middle, followed by one either side. This pro-technique is easy peasy thanks to our wide brush. 3. Apply a second coat for denser coverage. 4. Top coat required? Up to you, but it’ll give your color a super glossy, long-wear finish, so we recommend it! Add an extra coat 24 hours later for even longer wear. On short nails, Grace comes into its own with a chic touch of polish. On longer talons, the effect is all together more feline, but if that’s the look you’re going for, who are we to stop you? Broken nail? Time to file them all down and start again. Sorry – but it’ll look much neater, promise! Ingredients: butyl acetate, ethyl acetate, nitrocellulose, isosorbide dicaprylate/caprate, adipic acid/neopentyl glycol/trimellitic anhydride copolymer, alcohol, acetyl tributyl citrate, isopropyl alcohol, stearalkonium bentonite, diacetone alcohol, n-butyl alcohol, borago officinalis (borage) seed oil, phosphoric acid, hydrolyzed corn protein, hydrolyzed wheat protein, hydrolyzed soy protein, leuconostoc/radish root ferment filtrate, ci 15880 (red 34 lake), ci 15850 (red 6 lake), ci 77510 (ferric ammonium ferrocyanide). Lavender Nail Polish Remover 3.38 fl. oz. 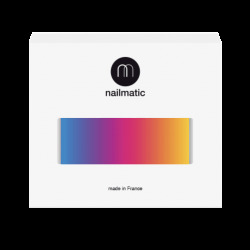 Get the best of nailmatic news in your mailbox: special offers, workshops, collaborations, it's all in our nailletter!